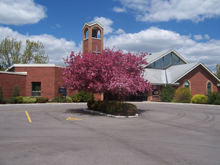 St. Paul’s Church, Nobleton, seeks a half-time Youth Pastor to work with current volunteer leaders to help the young people of our community connect with God, grow in Christ, and serve in community. About the congregation. St. Paul’s Church is a congregation of The Presbyterian Church in Canada located in the town of Nobleton, Ontario, in the heart of King Township. With a population of 3,200 people, Nobleton is surrounded by rolling hills and horse farms near the ecologically sensitive Oak Ridges Moraine. Located twenty minutes from both Pearson Airport and the town of Newmarket, and less than an hour’s drive from downtown Toronto, Nobleton still has a small-town feel, though its population is expected to nearly double in the next five to ten years with new housing developments. The congregation was begun in 1958 and became completely self-supporting in 1983. Only five years later, a major building addition was undertaken, giving St. Paul’s a fully accessible and functional campus near the edge of town on the main east-west thoroughfare. This church family is home to people young and old, and its youth ministry – the only one in the community – reaches far beyond the congregation itself. St. Paul’s exists to encourage people to connect with God, grow in Christ, and serve in community. This mission-purpose statement extends to all the ministries of the congregation, including the youth ministry. With some 30 young people participating in the group – and nearly 20 on a weekly basis – the elders of St. Paul’s believe it is time to provide some additional leadership to complement that being given currently by two couples in the congregation. Being involved in the life of the congregation, including Sunday worship. Remuneration will be commensurate with experience. A modest program budget will be provided. At least an undergraduate degree in theology or its equivalent, with some courses in youth ministry. The successful candidate will be knowledgeable in or willing to become knowledgeable in the spirituality and theology of the Reformed tradition and the Leading With Care policy of The Presbyterian Church in Canada (available at http://www.presbyterian.ca/ resources/online/275). He or she will require a current police records check, and a valid Ontario driver’s licence. Musical abilities and physical activity skills will be assets. Reporting structure. The Youth Pastor will be accountable directly to the Lead Pastor and will work with the Christian Education Team. Regular meetings with the Lead Pastor and other youth leaders will be expected. This position will be evaluated annually.